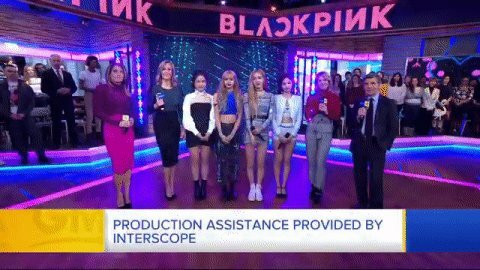 Good Morning America's tweet - "WE 🖤💗 #BLACKPINK and ALL of the blinks! Thank you for the BEST morning! #BLACKPINKonGMA #블랙핑크 #INYOURAREA "
WE 🖤💗 #BLACKPINK and ALL of the blinks! Thank you for the BEST morning! [TR] BİZ 🖤💗 #BLACKPINK ve TÜM Blinkleri seviyoruz! EN İYİ sabah için teşekkür ederiz! I'm so so so proud of these girls. Shoutout to @Interscope for giving them the best week in the states. Thank you for having them on the show! BLINKs 🖤💗 @GMA too! At least they do not look like an ad for a "feed the world' organization like the previous pictures did. So nasaan nga yung forever young?! !